Robin D. Laws, game designer by day, cinema super-enthusiast by night, sets his analytic laser sights on action and thrills in a collection of essays sure to supercharge your tabletop roleplaying experience. Star Wars as a model of storytelling economy. Crouching Tiger, Hidden Dragon to see how fights can express inner drama. Seven Samurai as a master class in theme. Die Hard as textbook cat-and-mouse. The Killer, to learn the blood-soaked vocabulary of blood-soaked hyper-romanticism. Detective Dee and the Mystery of the Phantom Flame, because deer fu. Though crafted as a companion volume to the exciting new reboot of his classic RPG Feng Shui, you can easily apply this book’s insights to any game with swords or explosions in it. 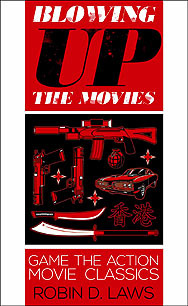 With a special focus on high water marks of the Hong Kong action golden age, alongside the flicks that inspired it and were inspired by it, the book also serves up a crash course in that essential action canon. So dig in, fire up one of these flicks for the first or five millionth time, and be ready to be blown up. Er, away. Blown away.